SA Express has remained silent on the decision taken by South African Civil Aviation Authority to ground its operations but has assured stranded passengers that they will be accommodated on another airline believed to be South African Airways. Meanwhile, workers’ union Numsa has expressed concern over the suspension of SA Express’s operating certificate, saying that more than a 1000 jobs were at stake. The authority made its shock announcement just hours after Public Enterprises Minister Pravin Gordhan on Thursday announced an overhaul of the company’s board, and well-known businesswoman Tryphosa Ramano as its new board chairperson, in an attempt to turn around the fortunes of the ailing airline. Hours later, the Civil Aviation Authority announced the suspension of SA Express’s air operators certificate and the certificates of airworthiness of nine of the 21 aircraft being operated by the airline. Gordhan reiterated that the cost of state capture, which had played a significant role in the state entity’s demise, would be a challenge to reverse. “The suspension of the airline is a classic example of the impact of corruption and malfeasance on the country’s national assets,” said Gordhan. He added that the grounding of the airline came as a result of consistent deterioration of the airline’s performance over the years that compromised the safety operation of the airline. FF Plus parliamentary spokesperson, Wouter Wessels, agreed with Gordhan saying, “the financial crisis at SA Express, which is the direct cause of the poor condition of their aircraft, is the result of years and years of poor management”. In the media briefing where Gordhan announced Ramano as SA Express board chairperson, he also revealed that the airline had paid R5.7 million to Gupta-linked Trillian Capital without following proper processes. For this reason, Gordhan said, he was compelled to send in an intervention team last week to “find out what was happening at the airline”, following the suspension of several executive managers on allegations of corruption. 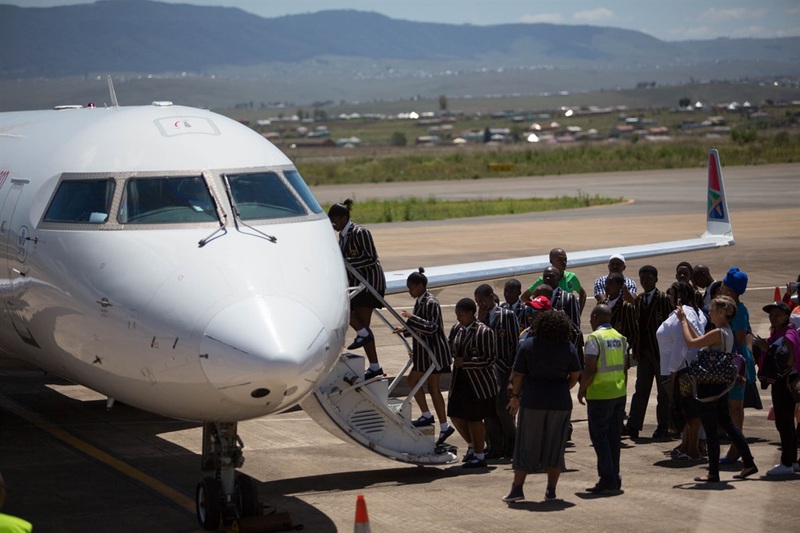 Gordhan expressed that even with all the maladministration and corruption “SA Express Airways remains a critical player in the economy in connecting smaller towns to the major economic hubs”. Workers’ union Numsa also expressed concern over the suspension of SA Express’s operating certificate. The union’s acting spokesperson Phakamile Hlubi-Majola said “the findings of the aviation authority are extremely worrying particularly as they have a direct impact on the operations of the airline. The union called on the management at SA Express to urgently respond to the recommendations made by the civil aviation authority and to act with speed to comply with safety standards. “We also urge the department of public enterprises to intervene because at least 1100 jobs are on the line if this airline fails to deal decisively with the problems raised by the civil aviation authority,” said Hlubi-Majola. Wessels, was particularly disturbed by how long SA Express management were aware of the poor maintenance on aircraft within their airline and “still allowed the aircraft to transport passengers at great risk to their lives as well as to South Africa’s population on the whole”. • He has identified an intervention team to support the executive management until a permanent team can be appointed by the board. • In addition, a team of technical aviation experts has been identified that will address the challenges that have continued to undermine the operations of the airline. • The intervention team is tasked with the following responsibilities in the interim to ensure the immediate stabilisation of the airline: technical, safety and maintenance; stop the bleeding and achieve financial stability; short term liquidity injection and put it on a path for re-capitalisation; and Leadership, governance and safety culture. Another step that the minister has been pondering on was to merger the ailing SAA, SA Express as well as budget carrier Mango. Wessels dismissed this proposed consolidation of SAA, SA Express and Mango saying it “will not save the entities. It will only lead to further ruin and it will be to the detriment of Mango, which is the only one that is successful at present”.